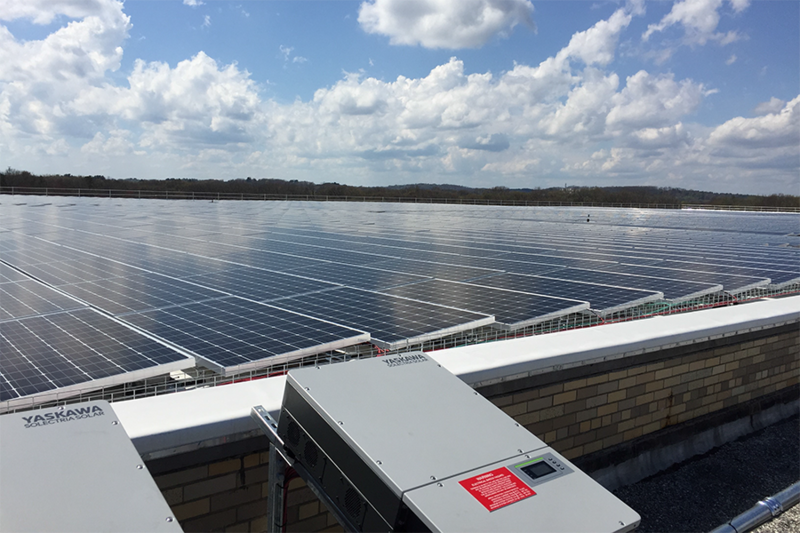 On April 11, 2017, North Andover’s town facilities began receiving power from 17,136 solar panels at Osgood Landing. For the next 25 years, every school, the Senior Citizens Center, the Youth Center, Town Hall, each fire station, the police station, the school administration building, the water pumping facility, and even the town-owned street lights will receive clean ener-gy produced right here in our town. 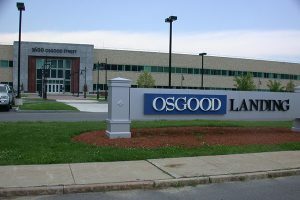 In the fall of 2016, the town entered into an agreement with Osgood Solar to purchase discounted energy produced from the 6 Megawatt plant located at 1600 Osgood Street. Through the Commonwealth’s Public Net Meter-ing Program, a public entity may choose to purchase energy credits from a privately-owned solar facility. By choosing clean energy from Osgood Solar, coupled with a 20-year Payment In Lieu of Tax (PILOT) agreement, the Town of North Andover will accumulate over $6M in energy savings and PILOT revenue. Further, the Town has zero capital invested in, and no operational responsibility for, the solar facility. For generations, North Andover residents have taken pride in an industrious and innovative history, much of that taking place at 1600 Osgood Street. This legacy con-tinues with choosing to power the town facilities for the next generation with clean energy produced at Osgood Landing. 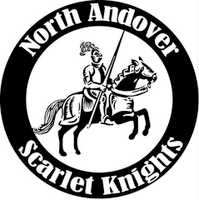 As we flip on the light switches in our classrooms and power the technology that is the backbone of our town, North Andover residents can take great pride in choosing power from the sun. When the sun shines, energy is produced by the 6 Megawatt plant that was developed, owned and operated by Os-good Solar—the owners of Os-good Landing. The energy is sent back into the power grid through a National Grid meter which is owned by the Town of North Andover. This meter, which is physically located at the 1600 Osgood Substation, spins backwards, generating a credit that National Grid applies to other accounts held by the town (i.e. schools, town offices, etc.). The economics are simple: For every dollar of credits received by National Grid, the Town pays Osgood Solar eighty-five cents. This fifteen percent discount on electricity is estimated to reduce the Town’s energy bill by $160,000 in the first year, and coupled with the PILOT payments, is a combined $250,000 annual value to the town, which in-creases as energy rates escalate. Beginning in 2015, the Osgood Solar team began development work that included careful coordination with National Grid, the Massachusetts Department of Energy Resources, the Town Planning and Zoning Boards, and the Town Manager. Despite a limited availability for this type of project and the strict state timelines, the industrial property was ideally suited to host a project of this scale. After just over a year of permitting and preparations, construction began in July 2016. About half of the 17,136 solar modules are located on newly re-roofed portions of the building. The other half are located on unused portions of parking lots in the north and rear of the plant. The solar facility interconnects to the power grid at the property’s robust substation, originally sized for the high-demand manufacturing operations of Lu-cent Technologies. On December 31, 2016, construction was complete and National Grid energized the plant to begin producing power during a start-up period. Shortly after, the facility passed a multi-day utility test and was authorized for full operation. Perhaps the most remarkable part of the Osgood Solar story is the local contribution to the project. Most of the major components of the project are manufactured by businesses located within a stone’s throw of Osgood Landing: The mechanical system that mounts the panels is produced by PanelClaw, a tenant that was founded at Osgood Landing and has grown to North Americas top producer of commercial rooftop mounting systems. Solectria Solar, a company founded and operated by North Andover residents, manufacturers inverters that turn the DC power to grid-ready AC power. The performance analysis system that will ensure optimum output is produced by PowerOwners, a start-up company and tenant of Osgood Landing. There were over 20 additional local companies that contributed to the construction of Osgood Solar, including 5 North Andover based companies: Warren Industries, ACE Solar, Trombly Brothers and L-COM.